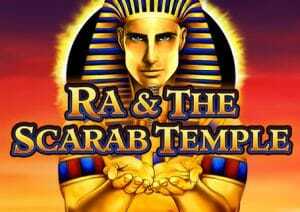 Ra & The Scarab Temple is an ancient Egyptian-themed video slot from Bally. This one is played with a 5 reel, 40 payline game engine and comes with mystery stacked reels, a rotating wilds feature and a bonus where you can choose from 5 free spin and multiplier combinations. Play on all devices from between 55p and £275 per spin. Red Envelope Jackpot feature – before any spin, you could see the stacked Red Envelope appear on reels 1 and 5. When this happens, you’ll win the jackpot amount shown in the top right of the screen. Mystery Stacked Reels feature – on any spin, any reel could be filled with Mystery Symbols. These will then all transform into the same matching symbol and a new payout is made. Radiating Wilds feature – this is triggered when any part of an obelisk symbol appears on the reels. The obelisk and the symbol positions directly to the left and right all turn wild and a new payout calculation is made. Retriggers are possible here too. Once again, a 5x payout is awarded. The same multiplier as originally chosen are applied to any extra free spins you might earn. Ra & The Scarab Temple certainly isn’t the best looking Egyptian-themed video slot you’ll see. The visuals are rather basic in fact. The range of extras make it a playable game though. The Mystery Stacked Reels and Radiating Wilds offer some decent opportunities and the multipliers can help in the free spins. If you’re a fan of all things ancient then Ra & The Scarab Temple is one to add to your rotation – you do need to try Book of Ra Deluxe from Novomatic though!